Aedes de Venustas Parfum d’Ambiance (room fragrance) was created for the West Village perfume boutique by L’Artisan Parfumeur and perfumer Bertrand Duchaufour. The Aedes de Venustas room spray harks back to earlier Duchaufour creations, Comme des Garçons Red Series Sequoia and Incense Series Kyoto and Avignon, the recent L'Artisan Dzongkha, and the wonderful Eau d’Italie perfumes. Duchaufour is one of my favorite perfumers. I have owned thirteen of his scents and appreciate their originality, their quirks, their strange accent notes that prevent excessive "smoothness" and instant familiarity. The lasting power of the Aedes de Venustas room fragrance is excellent and the room spray adds instant 'warmth' to any space; it's a perfect cool weather fragrance, suitable for use by a man or a woman. 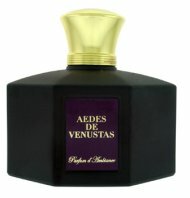 Aedes de Venustas Parfum d’Ambiance is a limited edition offering (4.22 oz. spray/$70). There is also a matching candle (6.2 oz./$60). Both the room fragrance and candle come in handsome matte glass containers with gold accents and are sold exclusively at aedes. This scent sounds marvelous (I especially like that it does double duty on skin). I always feel strange about spraying scent in a room–maybe it reminds me of lysol or cleaning up after pets. I do love flowers, incense, and candles for scenting a room, though. Have you tried the candle? Oh, that just sounds wonderful. I've been avoiding this one, but not sure that strategy will last much longer… I swear I have something else with strawflower in it, racking my brain but can't think of what it is. Yes, I think it does give a hay-ish note. Wore this on skin today for the first time, and it really is a wonderful incense scent…just the right amount of leather (meaning it may not be enough leather for March) and just the right amount of vanilla. It is great as a room scent but think I like it even better on skin.